The track I bring you today is one of those cool, obscure 45s that holds in its grooves not only a groovy little song, but a web of connections that is surprising vast (and interesting). 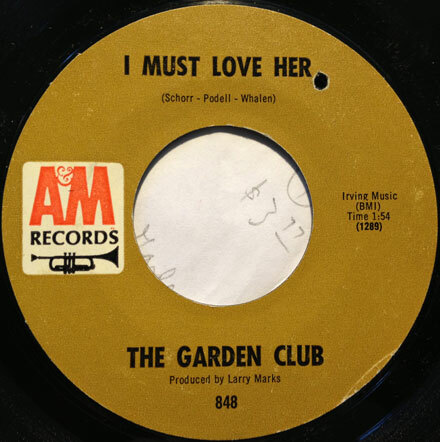 The Garden Club – as it was – only ever existed for this one 45. The principle members of the group were singers Ruthann Friedman and Tom Shipley. Friedmann, who recorded a groovy 45 (with Van Dyke Parks) and a very cool album is also known as the composer of ‘Windy’, one of the biggest hits of the 1960s, covered endlessly by a wide variety of artists and no doubt the producer of an endless supply of royalty checks in her mailbox. Tom Shipley went on to be one half of Brewer and Shipley, who made some excellent folk rock and had a big hit with ‘One Toke Over the Line’. 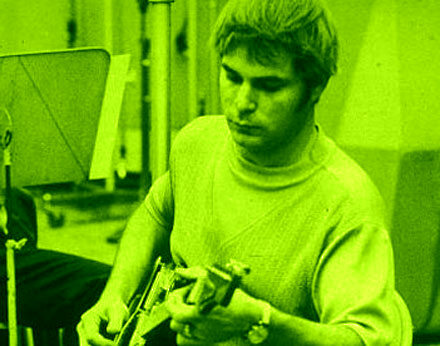 The composers were Daniel Walsh (who went on to writea bunch of pop stuff in the 70s, like ‘Temptation Eyes’ for the Grass Roots) and none other than Tandyn Almer. Almer hit the jackpot with ‘Along Comes Mary’ for the Association, as well as ‘Shadows and Reflections’ (with Larry Marks) for the Action, among others. The record was co-produced by Almer and Larry Marks. Marks had also written for people like Phil Ochs, Sagittarius, the Merry Go Round, Roger Nichols and others and produced a bunch of things, including co-producing ‘Gene Clark and the Gosdin Brothers’ with Gary Usher. Marks was also the voice on the original ‘Scooby Doo’ theme! So, with that remarkable provenance, the single is pretty cool, too. 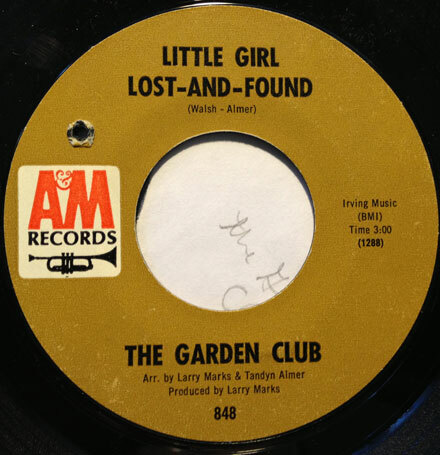 “Little Girl Lost In Found’ is a cool but of early, sing-song popsike, with a lead vocal by Freidmann, that sounds like it was recorded on a merry go round. ‘I Must Love Her’ is pretty drastically different, with lead vocals by Shipley and a darker, folk rock sound akin to the early Jefferson Airplane. There were a lot of artistic collaborations like this in mid-60s LA, but not many with this many tangents. 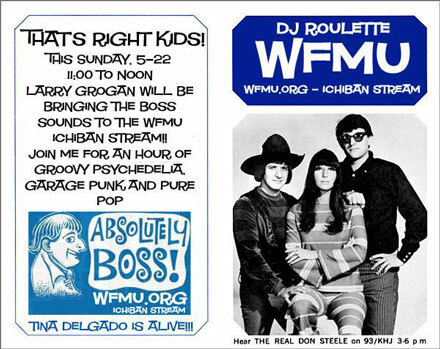 I hope you dig the tunes, and I’ll see you next week. This month I have a cool one for you, with a set of UK psyche and freakbeat (with a little Dutch garage tacked on at the end), a long set of covers of songs from the musical HAIR and some pop new arrivals. It’s a little longer than usual, but that just means more music. It also just so happens that today is the exact fifth anniversary of this podcast, with the first ep having dropped on 5/15/11! So dig that! I have something for you this week from the ‘incredibly strange’ file. 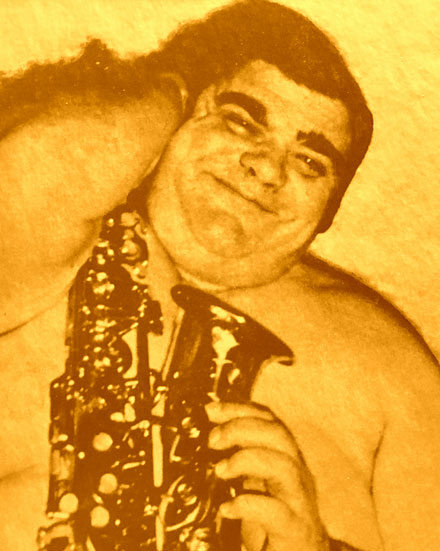 A while back I saw someone post about an album called ‘Sax Appeal’ by a guy named Herb Larson. They said that it was an above-average ‘easy’ played with lots of groovy touches, i.e fuzz guitar, sitar, drums etc. You know I’m always up for that kind of stuff, so I set out in search of a copy and found one for two bucks! Since the previous description – and the album’s presence on Command – had already piqued my interest, I pulled the trigger. When the record arrived, and I set to digimatizing, I was pleasantly surprised. Though the alto sax leads were played in a kind of wide open, Lawrence Welk-ish style, the backing was very cool indeed. It sounded as though the producers had set Herb up with a much hipper batch of studio guys. There isn’t a lot out there about Larson, but what I was able to find was very interesting. Larson – born Herb Lipschitz – was a Jewish bandleader from Newark, NJ who’s name shows up in a history of klezmer music. He and his band were apparently quite popular, playing all kinds of parties and events. His recording history is extremely limited. Aside from this – his sole date as a leader – all I can find is evidence of him recording as a featured player with the Irving Fields Trio (all looking much earlier than this album). Larson also appears to have been the grandfather of comedian Jeffrey Ross! That all said, as I dug into the album, I was very happy with what I was hearing. The arrangements and production were along the lines of the better Enoch Light-asociated stuff from the same era, with a clean, but groovy Now Sound thing going on, including tight drums, sitar, and fuzz/wah wah guitar. The covers of tunes like ‘Dizzy’ and ‘You Showed Me’ were highlights, but nothing prepared me for his take on ‘This Magic Moment’. 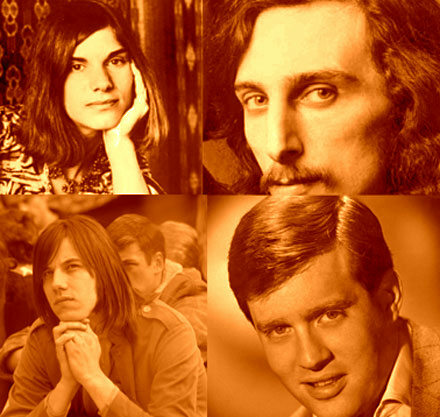 The Herb Larson version of ‘This Magic Moment’ is a demonstrably weird, genuinely psychedelic warping of the Jay and the Americans tune that verges on the avant garde. It sounds like a high society orchestra and Captain Beefheart’s Magic Band got trapped in a submarine and started jamming. Someone is messing with what sounds like a primitive synthesizer, or a broken theremin, or I don’t know what, and the band keeps weaving in and out (the drummer seems lost) with Herb soloing woozily, his axe sounding at times like a Varitone electric sax, and at one point it sounds like someone is tuning the sitar. I mean, I’m also posting a couple of the other, more ‘conventional’ tracks so you can get an idea what a departure ‘This Magic Moment’ really is. It’s not that there aren’t interesting touches in other places. The version of David Ruffin’s ‘My Whole World Ended’, which starts with the sax, but then opens up into something that sounds like ‘Eight Miles High’, and the guitar solo in ‘You Showed Me’ are both very cool. I haven’t been able to track down any detailed information on who the backing band are. 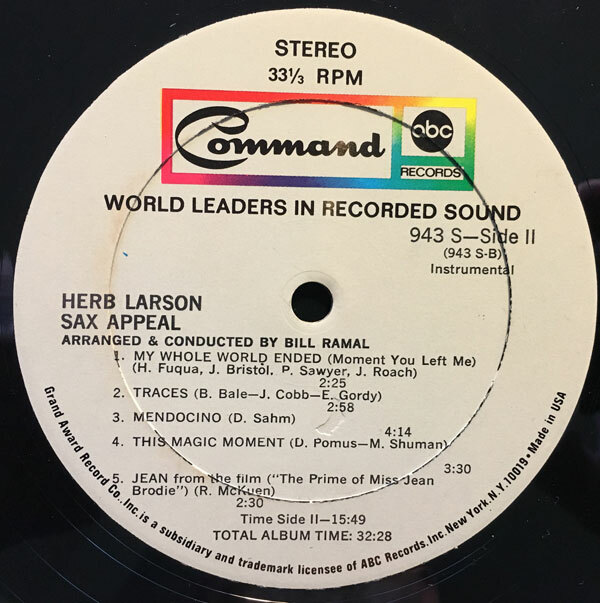 The album was almost certainly recorded in New York, but the arranger/producer is a guy named Bill Ramal, who seems to have mainly made a lot of pop/rock and novelty recordings as a sax player, producer, writer and arranger (including a lot of Dickie Goodman 45s). Were Herb and (or at least) the band tripping balls when they recorded this? What was the record company thinking? There’s nothing else here that isn’t aiming right for the easy listening market. I can’t imagine what people thought when they hit ‘This Magic Moment’, though it is the second to last track on the album, so maybe they were hedging their bets. Either way, there it sits, like a mysterious island, waiting to be discovered by people like me, who will either immediately pick up the needle and skip to the next song, or become entranced by it, listening over and over again. You do whatever you think is best. The 45 I bring you today (both sides) is another selection from the very interesting world of Joe South. South was one of the great songwriters of the 60s and 70s (as illustrated by the frequent presence of his songs on the charts with artists like Billy Joe Royal, the Tams, Lynne Anderson, Deep Purple and the Osmonds), and a very solid performer in his own right (his string of albums for Capitol between 1968 and 1972 is very, very good). 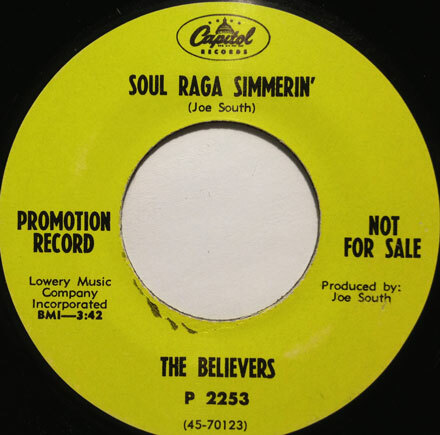 The Believers were South’s backing band, though as far as I can tell he plays on both of the 45s released solely under that name (there was one other on APT) , and the majority of the singles released as ‘Joe South and the Believers’ (on Columbia and Capitol) appeared on his own albums. 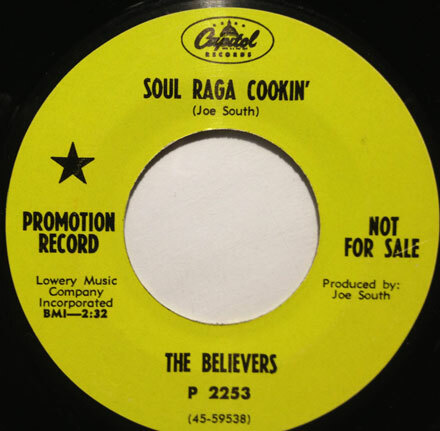 Today’s selections,’Soul Raga Simmerin’ and ‘Soul Raga Cookin’ appeared only on both sides of a Capitol 45 in 1968. The tune (same song, presented two ways) is a slightly funky instrumental that sounds like a cross between Bo Diddley, Ravi Shankar (South really loved that electric sitar) and an Alabama frat band. South was one of the great synthesizers of the various musical strains in the air in the ate 60s, and this 45 is a great (if slightly sloppy example of the kinds of things he was doing. I wouldn’t be at all surprised to find out that these cuts were a cast off from the sessions of albums like ‘Games People Play’ or ‘Don’t It Make You Want To Go Home’, especially considering the stray bit of studio talk at the end of ‘Soul Raga Simmerin’ where South can be heard saying “We can’t put this out.”. If you don’t have any of South’s albums, do yourself a favor and track them down. You will not be disappointed.